A proposed law is aiming to take away Maryland Comptroller Peter Franchot's power to regulate alcohol sales and taxation in the state. ANNAPOLIS, Md. — A proposed law is aiming to take away Maryland Comptroller Peter Franchot's power to regulate alcohol sales and taxation in the state. Franchot's current division is made up largely of law enforcement officers who frequently arrest suspects with ties to organized crime or on a terrorist watch lists. The proposed law in the General Assembly wants to change who oversees the enforcement division. "These handful of political bosses don't like me because I'm an advocate of craft brewers. They want to curry favor with the big beer companies," said Franchot. In the past, Franchot has had public arguments with the Speaker of the House Mike Busch and particularly with the President of the Senate Mike Miller. President Miller has criticized Franchot as well. "We should have an outside Comptroller take over the position of Comptroller because he obviously is doing a terrible job at the present time," said Senator Miller. Franchot says legislative leaders and some law makers have shut out smaller craft beer makers to keep big beer companies a large share of the market. Now, a bill has passed the House and Senate that would split up the responsibilities currently under the Comptroller's control. 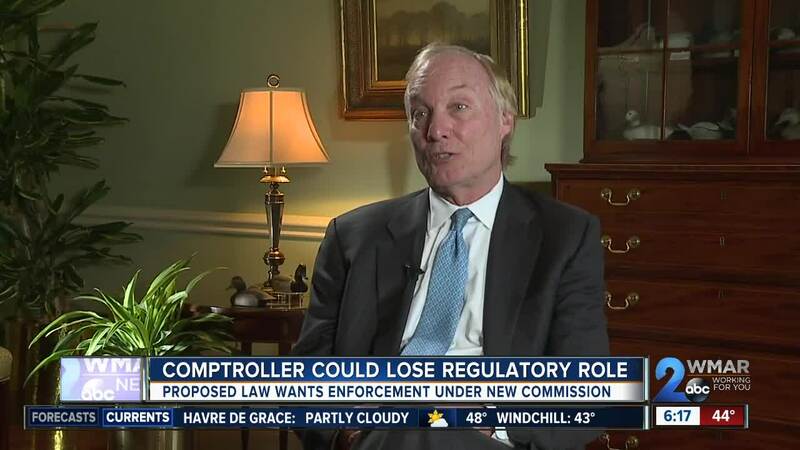 "And at the same time a handful of political bosses are trying to disassemble my agency, costing the tax payers $50 million by taking the enforcement division away from me and giving it to some nameless commission," said Franchot. As well enforcing tax laws, the proposed law wants the division to deal with health issues related to alcohol something under the Department of Health's jurisdiction. Delegate Warren Miller is the sponsor of the bill. "This new office we are creating needs to be a clearinghouse for health related information around alcohol," said Delegate Miller. The enforcement division has about 70 people. "We would take those employees and they would physically move to under a new independent commission much like the lottery commission or stadium authority," said Delegate Warren. The Comptroller's office says this would cost $50 million over five years, the Bureau of Revenue Estimates puts it closer to A $7 million impact over five years, but they say many aspects can't be determined yet. The enforcement group has been together since the days of prohibition. Some feel this is purely political and retribution against an out spoken Franchot. Todd Eberly is an Associate Professor for Political Science at St. Mary's College in Southern Maryland. Are these measures making Maryland better? "It's hard to see how this makes things better. There's no indication that the field enforcement division hasn't been doing an exemplary job as it's currently structured. So to take it out of the comptrollers office, to have the transition period where it goes into the governess of this new commission, I think you got at least the possibility that things won't go smoothly," said Eberly. The legislature is trying to pass a billion dollar education bill and has stated they don't know where they are going to find all the money for that bill. "So even $5 million on something like this, I think the question needs to be asked is this the best use of our resources at this time," said Eberly. "You know the legislature has introduced more than a hundred bills to take power away from me, this is now trying to take away power from the comptroller. Even though he's in the same party, they don't like the fact he's working in a bipartisan way with us for the people of Maryland. It's pure politic; there's no other reason for it," said Governor Hogan. So will Franchot quiet down now? "The only thing silent about Franchot is the T at the end of my name. I'm going to continue to speak out," said Franchot. The bill is on the Governor's desk. Hogan has until Wednesday to act on the bill. If he vetoes it, the House and Senate can override the veto with a super-majority, that is a 60 percent vote.